The recent rededication of the Hurva Synagogue in the Jewish Quarter of the Old City of Jerusalem, a synagogue going back to circa 1700, destroyed twice and rebuilt three times, occasioned noisy outbursts of Arab anger. One Arab group supposedly devoted to "human rights" called the rebuilding a "war crime." This shows "human rights" is sometimes used as a slogan to mobilize hate against the rights of Jews. Other groups and mouthpieces of both Fatah/PLO/Palestinian Authority and of Hamas raged against the rebuilding and called for mob action against it, in some cases alleging a threat to the al-Aqsa Mosque on the originally Jewish Temple Mount [here & here & here]. 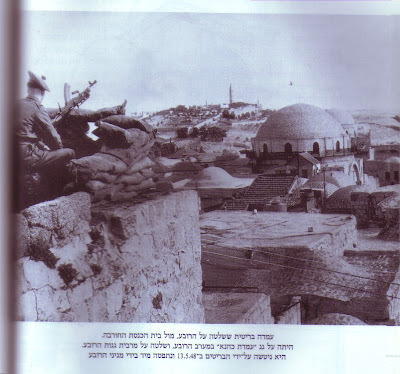 Here is a series of photos showing the Hurva Synagogue and the Jewish Quarter of the Jerusalem Old City before and after the fighting. 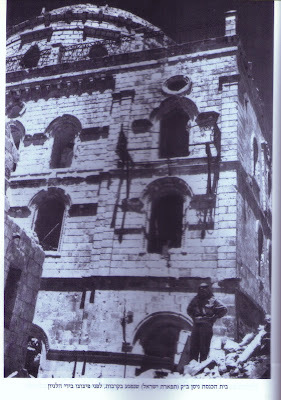 This shot shows a British soldier in a guardposition on a building in the western part of the Jewish Quarter. The position was called "The Kahana Postion." The Armenian Quarter which is just west of the Jewish Quarter is behind the soldier. The major combat did not begin until the British left the Old City 13 May 1948. The Hurva Synagogue stands out in the right center of the photo with its great round dome. The mountain in the east is the Mount of Olives. A soldier of the Transjordanian Arab Legion stands on a roof in the market in the center of the Old City, near the tower of the Lutheran Church of the Redeemer. 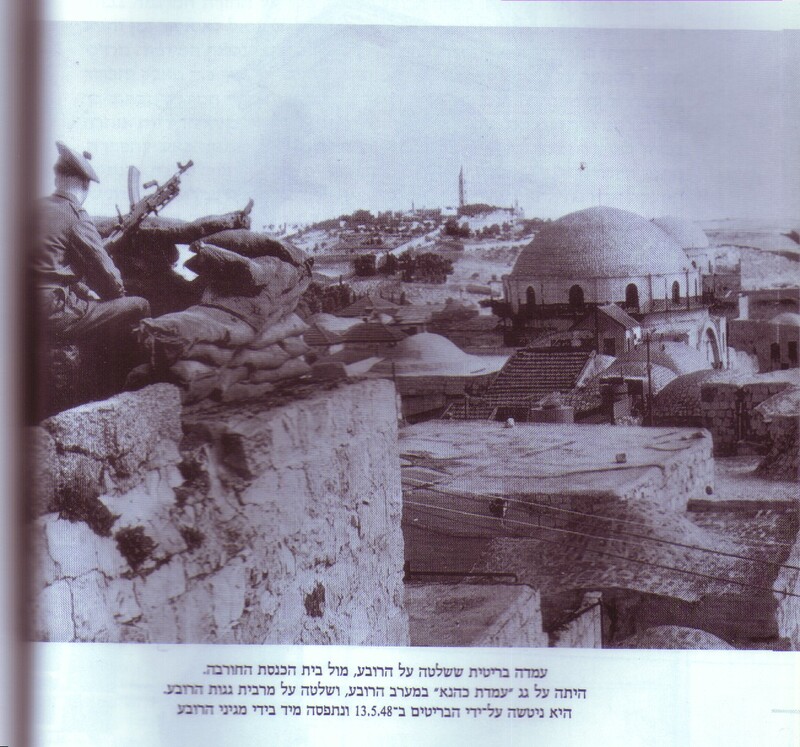 The dome of the Hurva synagogue is seen to the south in the background of the photo, apparently shot after the battle for the Jewish Quarter had ended with an Arab victory. 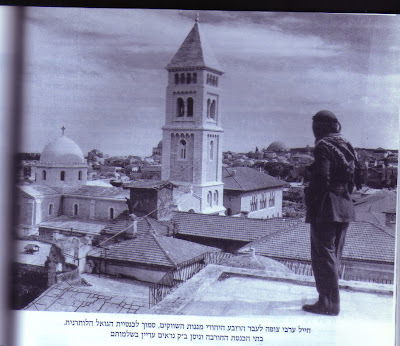 Another domed-roof synagogue, the Tif'eret Yisrael [also called Nisan Bek] Synagogue is partly obscured by the Lutheran church tower. This church is in the Christian Quarter in the northwestern corner of the Old City, the Jewish Quarter lies to the south-southeast. The Hurvah Synagogue would shortly be blown up by the British-officered Arab Legion. 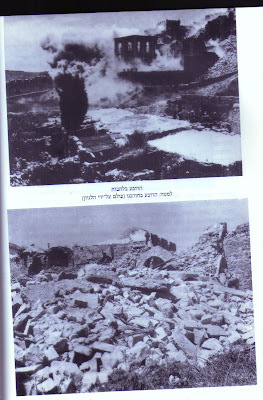 The Tif'eret Yisrael [Nisan Bek] Synagogue which was hit in the battle before being blown up by the Arab Legion. A legionnaire stands on a pile of rubble outside the synagogue. 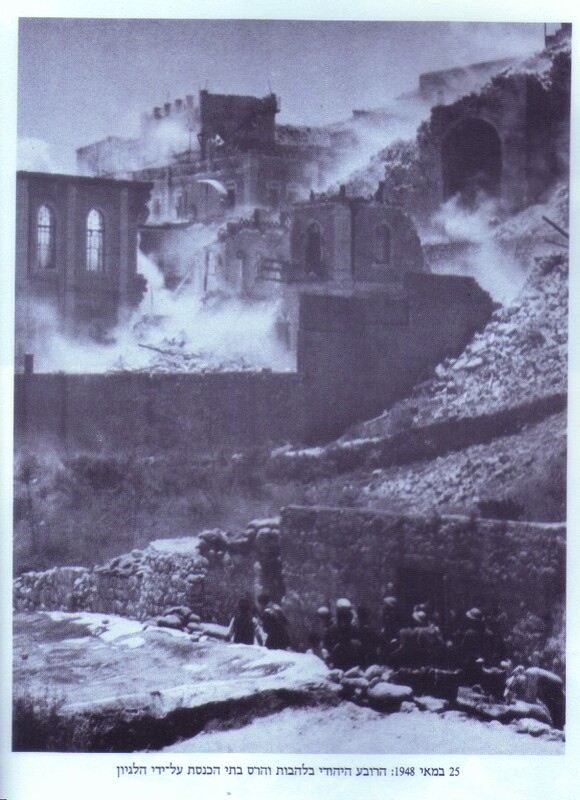 This shot shows the Jewish Quarter in flames on 25 May 1948, with the destruction of some of the synagogues and yeshivot [academies for study of the Bible and Talmud] by the Arab Legion, Sir John Bagot Glubb commander. Smoke and flames are visible. Note on the left of the photo the still standing walls of a public building --perhaps the Porat Yosef Yeshiva-- with flames inside and apparently without a roof. Our previous blog post here gives a brief account of the Hurva.